I am just getting home from 4 days in the woods. I will try to hit the high points of the hunt. 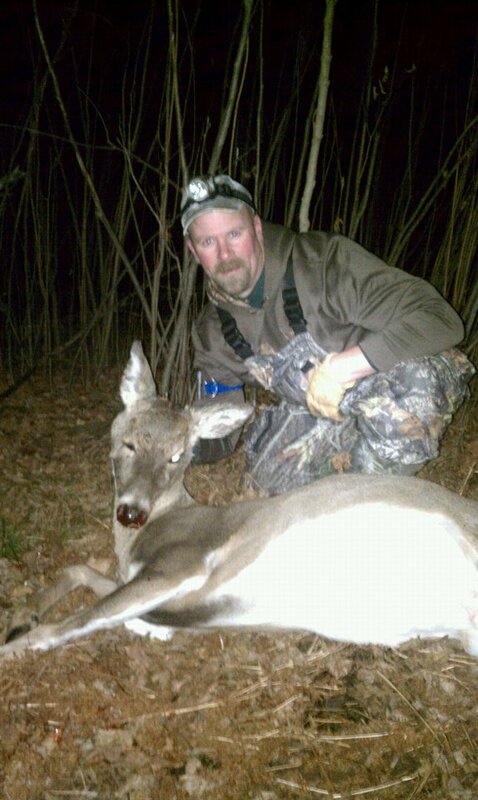 Midday was really slow, but towards evening I had a good size doe come in, and since she was alone, without a buck, I decided to try and take her. She turned broadside a about 13yds. I did get a touch high and got liver. She went maybe 50yrds. I was happy to have her. Thursday morning was 36 degrees, but the wind was really howling, and me and my tree were rocking! I was glad to have my Hunters Safety Vest on. I had barely climbed into the tree after putting out some scent when I had deer come to within 20 yds of my tree, then take off. Just after light I had a doe come racing through followed by 2 small bucks. One just had a club for a rack, and the other was a small basket 8pt. Around 9:30 I heard something coming down the big rock hill. I see a really nice, big mature buck, maybe a 10pt coming my way on a dead run. No chance to draw or stop him. As I am watching to see where he was head, I was wondering why he was running. Seconds later I hear something else coming. 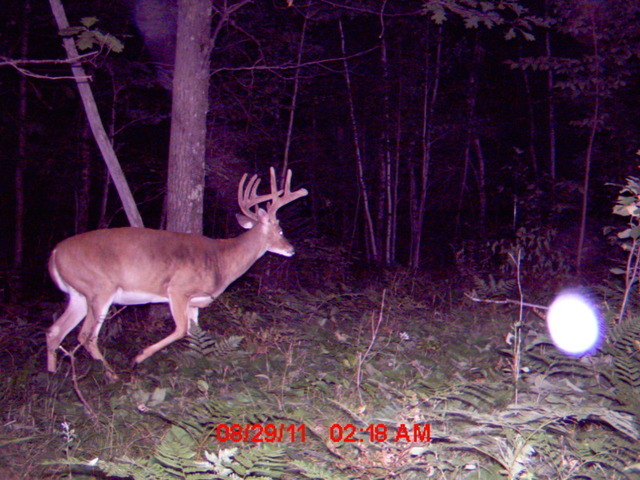 Turns out there is a dog or wolf running this buck. I think it was a dog because of the markings and it didn't look quite like a wolf. It all happened pretty fast, but either way it wasn't good. I hope that buck gave him the slip! By about 1pm, I had enough staring into 30 mph winds from the north and called it a day. Friday it was 26 degrees and much less windy. I thought it was going to be good. It didn't get good until around 1pm when I had a young doe work to about 10yds from my tree. I was tempted to put a arrow in her, but passed and watched. She ended up bedding down about 40yds away from me. She laid there for probably 45 mins, when I noticed another young doe coming towards us. I knew the bedded doe saw he, but the standing one didn't know she was there. When she got up, she surprised the other one a bit. They fed separate for a bit, but when they came together they were licking each others face and ears. All this was being done at about 20 straight down wind of my stand. As I was taking in the show, I hear burrp, burrp, and leaves crunching coming towards us. I see a doe leading a buck. The 2 young does blow out and there is a big ruckus! I didn't get a good look at the buck as they never got to withing range. It was pretty exciting for a minute though. About a hour before dark, I heard deer coming from the way I had last seen the others. 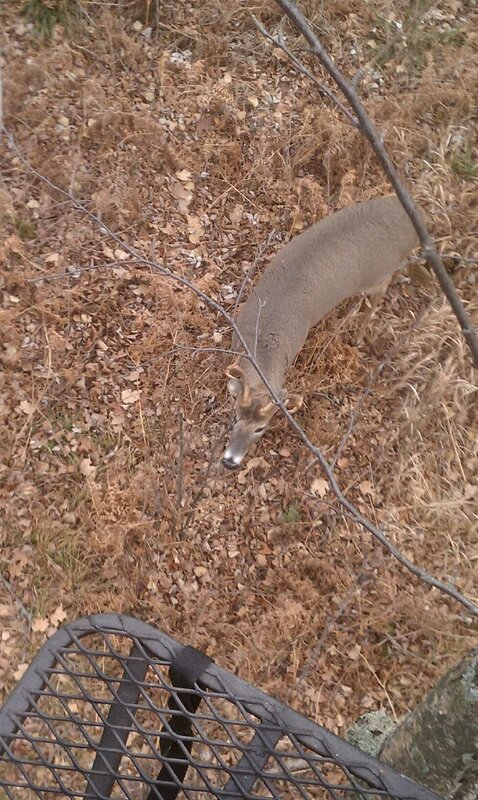 When I finally got see something, it was a basket 8pt. 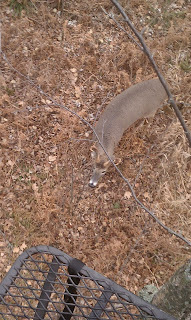 As he was feeding towards me, I thought I would get a better look, he bedded down about 50 yds away. He stayed until it was time to get down. He was lower than me so I knew once on the ground he wouldn't be able to see me. I used the tree for cover and high-tailed it out of there. Today was a great looking morning, no wind, and about 26 degrees. It was so quite in the woods that red squirrels sounded like deer. The deer were not moving this morning at all. My theory is that with the full moon they had moved all night and were now bedded. I finally caught a glimpse of a deer around 11, but after I gave it a chance to work my way, I got down to head home and take care of the doe after letting hang of a few days. 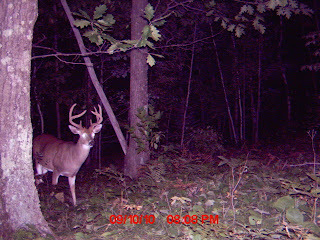 I will be headed back to the woods in a few days with hopes of hitting the peak of the rut....stay tuned! I made it out yesterday morning with high hopes of seeing evidence that the rut was cranking up. I hit my stand a hour before shooting light. It was a cool 39 degrees, but it was a little on the windy side from the south. About a 1/2 hr into the sit I heard something trotting towards me. I tried best I could to make out anything, but I never did get a look. It didn't sound to heavy as it ran by. Around 9:30 I happened to look out about 60yds to catch a glimpse of a buck. Unfortunately he wasn't coming my way. I tried grunting a bit, but he wasn't interested. About 10 mins later I saw a buck come from the way the other had gone. I am not sure if it was the same deer or not, but he just moved off too. I hunted until 11:30 or so, but the wind had really picked up and I had to head home anyway. 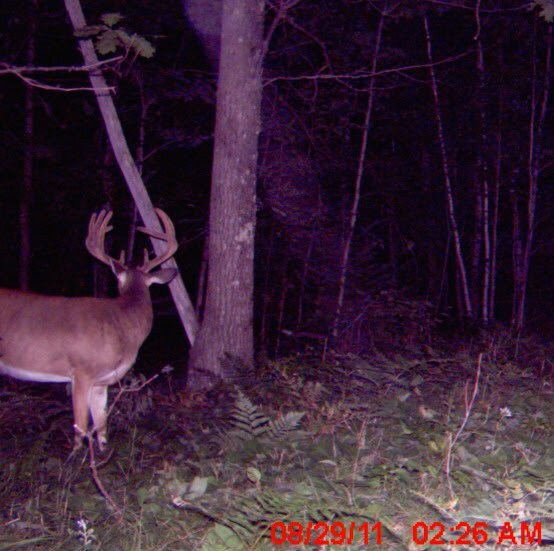 The hit list buck is hopefully staying away from the rifle hunters, as that season opened yesterday. Good luck in the woods. Greetings! The 2011 Archery Season is under way in Minnesota! With my work schedule, and unfavorable winds, I don't have much to report yet. 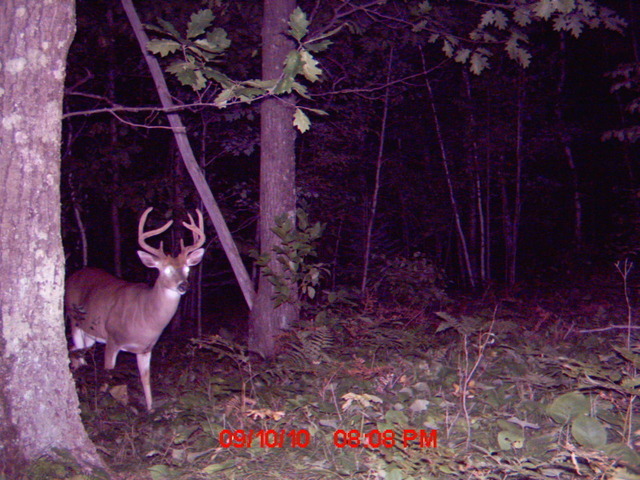 I did however want to post a few pictures of a deer that on my hit list. I caught him on camera last year also, just never on the stand. Maybe this year will be the year!